Yes, I still use my faithful OLPC XO-1! It’s amazing that, even after all this time, the readability of the XO-1’s screen still bests that of mainstream notebooks. Today I picked up my XO keyboard+Touchpad replacement part CL1B from the always-great ilovemyxo.com. This part actually comes from the next generation OLPC (the XO-1.5), but perfectly fits the OLPC XO-1. I was mostly interested in getting the upgraded touchpad, which was always flakey on the original generation computers. From start to finish, it took me about 20 minutes to do the disassembly and replacement, following the instructions at http://wiki.laptop.org/go/Disassembly and with a single Phillips screwdriver in hand. My 3-year old daughter watched excitedly beside me and “helped me” as I upgraded her computer. I plugged in the computer, held my breath, booted it up, and everything worked flawlessly. And yes, the new touchpad is much better than the old one! Here’s a picture of the new keyboard and touchpad. Fingers are my daughter’s, not mine! And for comparison, here’s the old keyboard. This is nice because you probably just use regular wireless and don’t use or require mesh networking at all, so you might as well turn it off and save some power and complexity. More details on the other ways you can control the mesh network via the firmware are in Trac. Clearly, I’m working on it. Yup, I finally decided to update the blog software to something more modern. Hang on while I tweak things and import in the old content. In the mean time, why not try out the new TinyCore image for your OLPC XO-1? Despite the third point, I still not only enjoy my OLPC, but I would argue that it remains the best netbook and e-book reader for me! Now admittedly my needs and requirements may be specific, and certainly the software customizations I have done may be out of reach for the standard G1G1 recipient. 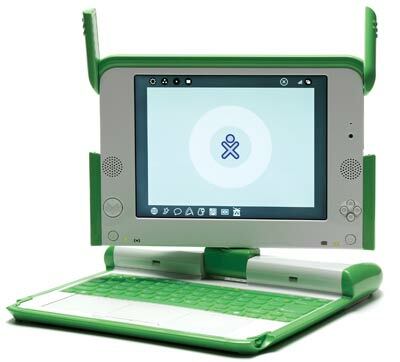 I definitely feel that the OLPC XO-1 machine is underrated, with many people criticizing it or trying to offload them on eBay. I am somewhat surprised that more has not been said about the positives of the OLPC, so to bring balance back to the Internet, I have been meaning to both describe why I like the machine so much. I also intend to describe through series of posts document the customizations I have done to bring it to the much more usable state, for my specific and decidedly non-child needs. Let’s start today with the Top 8 Reasons I think the OLPC is a great general purpose netbook and e-book reader. I love the screen on the OLPC, and eagerly await the day that Mary Lou Jepson’s screen technology, invented for the OLPC, eventually reaches other netbooks and notebooks through her Pixel Qi commercial enterprise. Until that day, I am amazed that more has not been said about the OLPC’s fantastic screen. 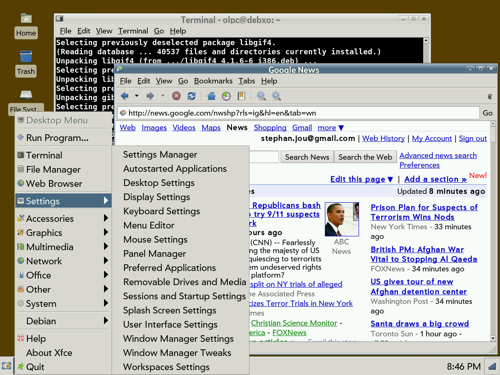 At 1200×900, the screen is higher resolution than many netbooks out there even over a year later. Plus, unlike the current trend in even high-end notebooks, the focus is on readability over accurate color reproduction. This means the screen has almost no glare, and is completely readable even in complete sunlight. In fact, I can drop the OLPC’s screen to a low-power black/white only mode that produces a display comparable in resolution to e-ink based displays like on the Kindle. However, unlike the Kindle, I still have color support so my movie videos or comics still show off in full color. Pixel Qi has announced that it is manufacturing screens for other netbooks, eReaders and tablets. I for one can’t wait, but for now, the best screen for me is my onmy XO-1! I’m a big fan of silent computing, and this becomes even more important when reading in bed and not wanting to disturb the sleeping wife. There are no moving parts in the OLPC, as everything is solid state, like the Dell Mini 9 that remains popular among its other siblings in the Dell Mini line for precisely that reason (among others). There’s no spinning hard drive, but with a 16GB SD card in the slot I am completely able to cope with the extra space a hard drive would have provided, in favor of being able to avoid noisy fans spinning up and down. 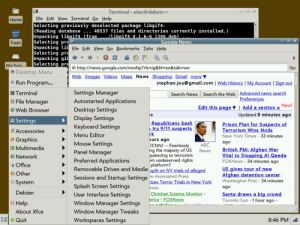 With a Linux variant running on the OLPC, it is actually fairly straightforward to install any number of browsers, including Chrome, Firefox, Midori, Opera or (my current favorite) Epiphany. With the exception of Flash-based videos, which are not important to me, everything renders quickly and beautifully, and looks just like on my PC. The very wide 1200 pixel screen also means less horizontal scrolling than I would need on even most “real” netbooks today. Whether you stick with the Fedora-based installation that comes with your OLPC, or another Linux variant, there are readily available programs for reading PDFs, eBooks of various formats (my favorite being .pdb files from Fictionwise), and even comic books and full screen movie files. My friends are usually surprised when I show them movies that I had ripped from DVDs playing back smoothly and without stutter using mplayer! At $400, the XO-1 was pretty expensive in netbook terms, but nowadays you can get used OLPC units fairly readily on eBay for much less. Even better, replacement parts and extra batteries are available from online vendors like www.ilovemyxo.com and www.xoplosion.com. How many netbooks can do this? 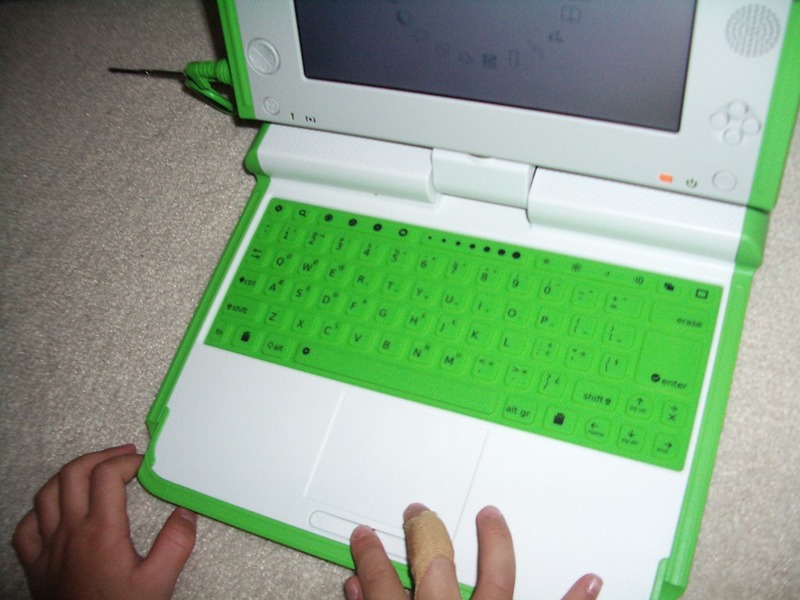 The OLPC XO-1 allows you to swivel the screen around as you would on tablet PC systems. With your PDF reader in full screen mode, you can then hold the unit like a book and page through with the d-pad beside the screen. Or you can hold it like a slate on the airplane and watch a video! 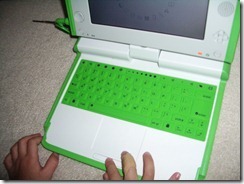 The OLPC XO-1 was built to survive harsh environmental conditions AND be child-proof. It’s far more rugged than some other sub-$400 netbooks. My toddler has drooled on keyboard and screen multiple times, with no ill effect. 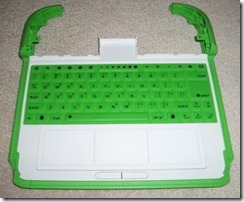 Here’s the surprising one — I like the OLPC keyboard. Maybe I have small hands or something, but I am a touch typist, and I have no problems flying along on the OLPC membrane keyboard. 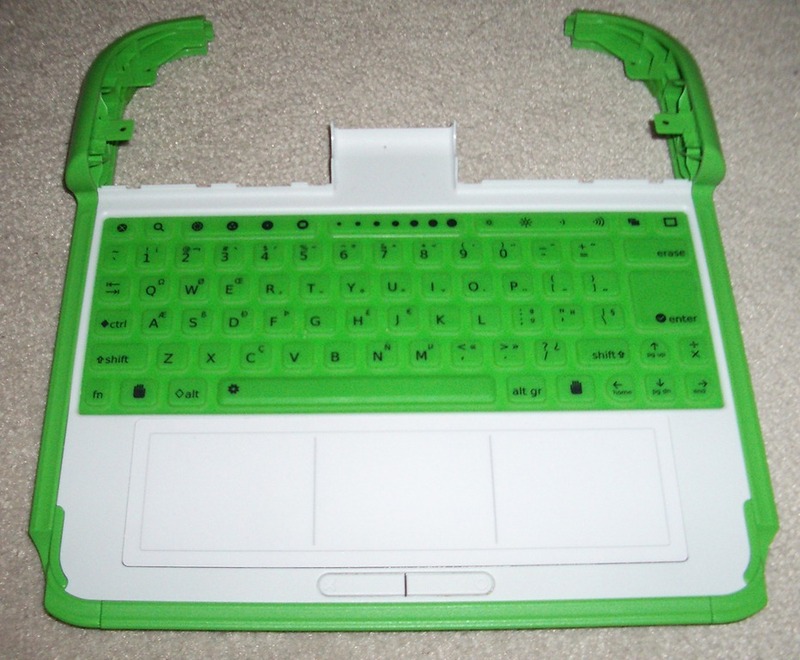 In fact, I wrote this entire (long) article on the OLPC keyboard. I have no problems touch typing on it for long periods of time, and I like how quiet the rubbery keys are. However, I recognize that most people will disagree with me here. There are other features of the OLPC even beyond those above that I could have mentioned, but didn’t make the cut. I love the way the three USB ports are there, but can be protected by the “ears” to keep dirt out. I love having the dedicated screen rotation button on the front. I appreciate having the headphone jacks, video camera, and microphone, although I don’t take advantage of those features in the way I use the OLPC. But I’m getting side-tracked, and I think my point is made. I wanted to spread some OLPC love to counterbalance some of the skepticism. Even today, this nearly two year old piece of technology continues to amaze me with the design and thought that went into it, and the sheer utility that has far exceeded my expectations. With the right customizations, the OLPC can be a fine computing device for adults. Don’t ignore it as a possibility for your needs! Maybe it’ll work for you, too?